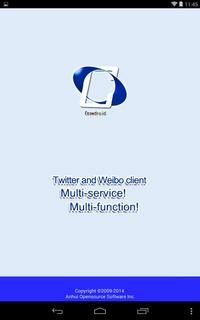 Crowdroid is a multifunction Twitter and Weibo client. 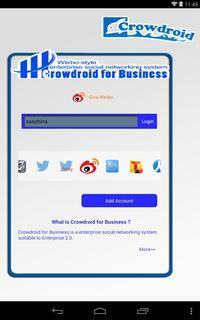 You can not only use Twitter, but also use Sina Weibo,Tencent Weibo,Sohu Weibo, Renren and Crowdroid for Business. Meanwhile, Crowdroid has additional functions such as Tweet Translation, voice input, tweet to multiply microblogging services at the same time, wallpaper change, font size change, and image upload. You can more details about "Crowdroid" here. - Stop to support Sohu Weibo, Netease Weibo and Twitter proxy. - Added saving the draft function. - Improved the screen refresh function on the top page. - Further improved the method of network communication. Because Sohu Weibo has the authentication problem, so Crowdroid cannot register the new user on their platform. - Added to support OAuth 2.0 authentic method of Tencent Weibo. - Picture upload function changed to use the Twitter official API. - Further improved the off-line reading function. - Upgrade the Baidu translation feature. - Further optimized to support the many type of resolution. - Further improved the communication method. Updated the communication method of twitter. 1. Optimized for Android 4.4. 3. Added the function that user can delete any data that got in the off-line mode. 4. Improved the DM function in CFB. 5. Added a comment list on a tweet page in CFB. 6. Delete the limitation of uploading the file size in CFB. 7. Improved the schedule function in CFB. 8. Added the error message when user will upload the file over than each service limitation. 9. Other bugs are fixed. ?Added saving the draft function. ?Improved the screen refresh function on the top page. ?Other improvements and bug fixes. Author: Anhui Opensource Software Inc.